Today, enjoy great savings on the Energizer Ultimate Lithium Headlight. The Energizer Ultimate lithium headlamp is perfect for people who love the being outside after dark, professionals, and anyone else who is in need of a powerful headlamp. The Ultimate Headlight by Energizer offers five light modes; high white, medium white, low white, strobe, and red, that way you are sure to have plenty of options to choose from which will be very handy while working in the dark. 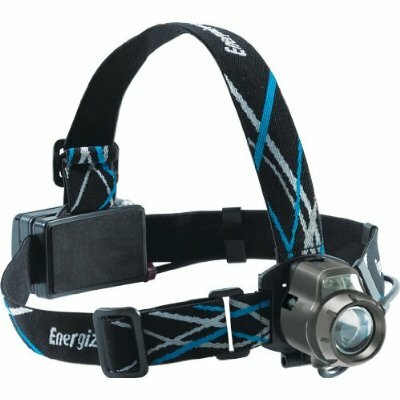 The Energizer Ultimate Lithium Battery Headlamp is situated on a pivoting mount which allows you to aim the light exactly where you need it for a more detailed view in the dark. Everyone loves the boost button, which provides 130 lumens of ultra-bright light for 15 seconds. With the boost button, you can do everything from locate something you dropped or to see the path 450 feet ahead, all without diminishing precious battery life. Other features include a green LED “find me” or “follow me” option, a focusing mechanism that regulates the beam from tight spot to wide floodlight, and an adjustable headband. The Energizer Lithium Ultimate Headlamp will run for up to 11 hours on the maximum setting and is water resistant to ensure you have the best experience possible.